‘The Cosmos Osza’ is a typical Kusama painting, featuring the characteristic polkadots in all sorts of colours, representing the circles of the earth, the sun, and the moon. Therefore aptly named ‘Cosmos’. When the beholder is moving in front of the painting, the high-coloured acrylic circles have the effect of changing colour. In the late 1970’s, after experiencing psychiatric problems, Kusama voluntarily admitted herself to a mental hospital near Tokyo, which she has called home ever since. From here, she continued to produce artworks in her own studio, in a variety of mediums, as well as launching a literary career by publishing several novels, a poetry collection and an autobiography. Kusama made this painting in 2007, the same year that she was commissioned by the Beverly Gardens Park in Los Angeles, for which she made a large scale sculpture titled ‘The Hymn of Life: Tulips’. Yayoi Kusama, currently at age 83, is an internationally acclaimed artist and is still active in her Tokyo-studio. 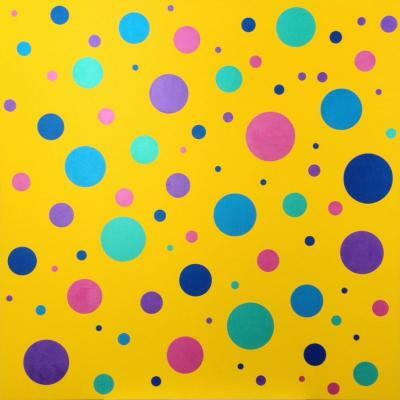 The colourful polkadots, considered Kusama’s main motive, figure in her work throughout her entire life. A famous quote: “If it were not for art, I would have killed myself a long time ago”. Well-known for her use of dense patterns of polka dots and nets, as well as her intense, large-scale environments, female Japanese artist Yayoi Kusama works in a variety of media, including painting, drawing, collage, sculpture, film, performance, and immersive installation. Typical is her use of psychedelic colours, patterns and repetition. 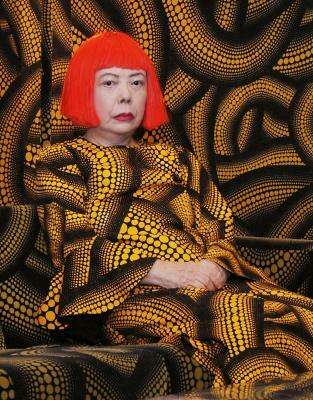 Born in Matsumoto on March 22nd, 1929, Kusama . . .